Explanation: The Leonid meteor shower was not the only good meteor shower this season. Earlier this month, the annual Geminids meteor shower peaked, featuring as many as 140 meteors per hour from some locations. 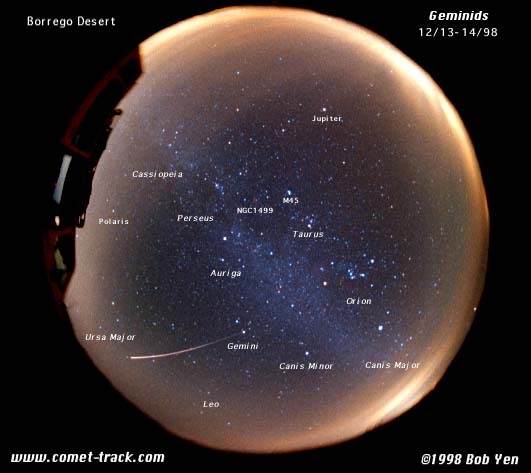 Geminid meteors can be seen streaking away from the constellation of Gemini, as depicted in the above all-sky photograph. The origin of the Geminid meteors is somewhat uncertain but thought to be small bits broken off the unusual asteroid 3200 Phaetheon. Many observers reported that the 1998 Geminids were typically less bright than the 1998 Leonids, but appeared more bunched, with groups of two or three meteors sometimes appearing simultaneously. Next years' Geminids might be better yet.